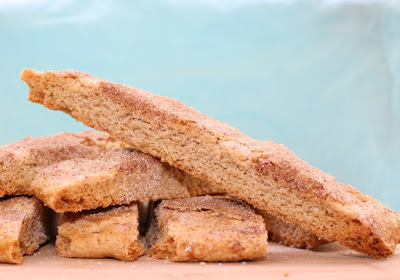 Pep up your morning coffee or tea with a biscotti version of that classic childhood cookie, Snickerdoodles. Preheat oven to 325 Fahrenheit. Line a baking sheet with a silpat mat or a piece of parchment paper to prevent sticking. In a medium bowl, whisk flour, cinnamon, baking powder and salt. In a mixer, cream the butter and sugar until light and fluffy. Scrape down and beat in the egg and egg yolk. Beat in the vanilla extract. Add the dry ingredients to the creamed butter. Mix until all ingredients come together into a moderately stiff dough. 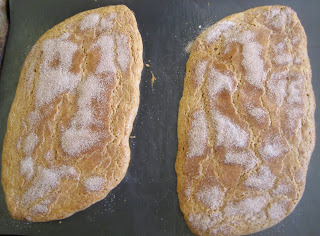 Divide the dough in two mounds on the baking sheet. Shape each half of dough into a 8-inch by 3-inch rectangle. Note that I've angled the sides of my dough to maximize the number of tasty biscotti that result once they're cut on an angle. The dough will spread considerably so give yourself ample room between the logs. The angled edges mean more full-sized biscotti per each log. Whisk together the cinnamon and sugar for the topping. 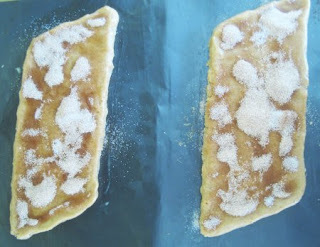 Brush the shaped dough with the beaten egg and sprinkle with cinnamon sugar. Bake for 20 minutes. Rotate the cookie sheet for even baking and bake for 20-25 more minutes until golden and firm to the touch. Remove from the oven and let the biscotti cool until able to handle. Using a sharp knife, cut logs into 3/4-inch wide diagonal slices. Try to cut each biscotti in one smooth motion. This will give your biscotti nice clean sides without the edges snagging on the knife the way a sawing motion does. Place biscotti cut side down on baking sheet and sprinkle with more cinnamon sugar, if desired (I did not). Bake again until pale golden, about 10- 20 minutes. Check every 5 minutes to ensure that they're not getting overly browned. Some recipes instruct you to flip your biscotti half way through this process, but I find this unnecessary. 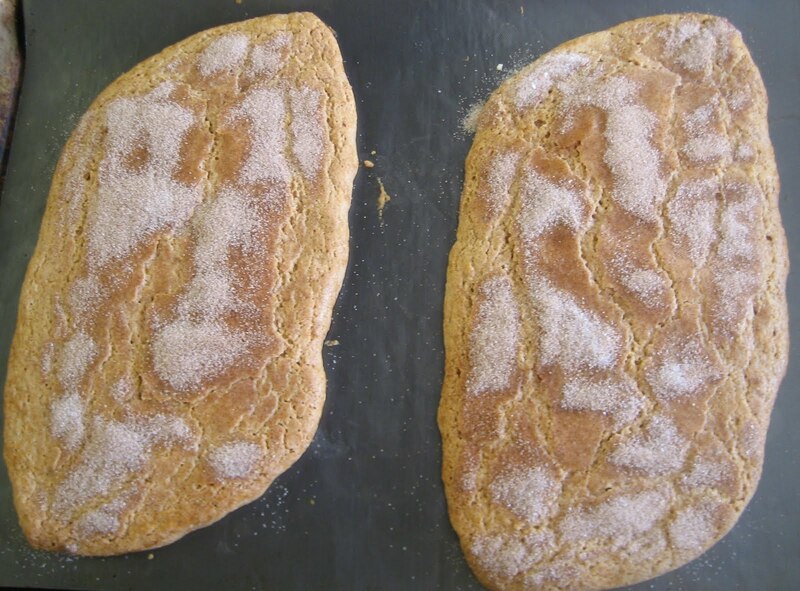 The biscotti will be browned successfully on both sides provided the slices are not overly wide (greater than 1 and 1/2-inches). Your tasty snickerdoodle biscotti will crisp up as they cool. Enjoy with coffee, tea, hot chocolate, or all by themselves. 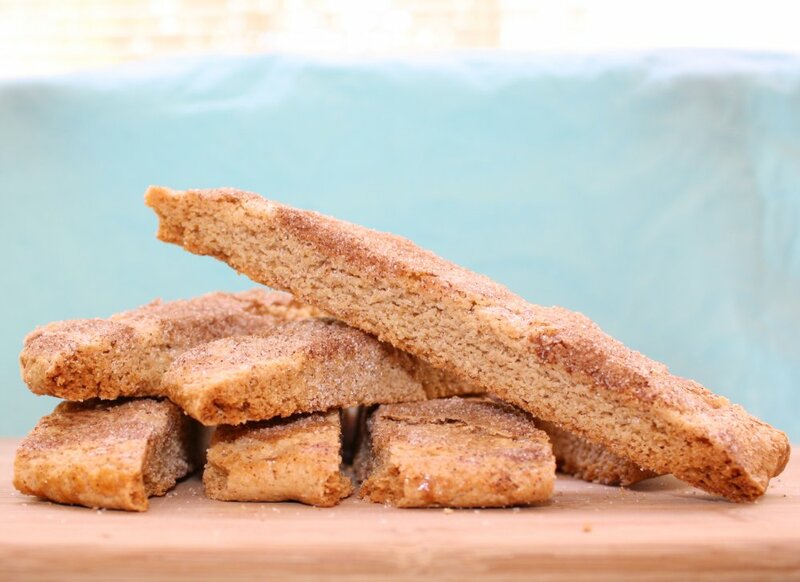 Like recipe riffs on traditional biscotti? Take a peek at these posts on Peanut Brittle Biscotti and Mint Biscotti Dipped in Chocolate. Thanks so much! I am definitely going to try this one!